How does a speaker system work? Why do figure skaters spin faster when they draw in their arms and legs? Where does static electricity come from? How much energy does a lightbulb use? Native American students asked these kinds of questions on Friday, July 25th, as they participated in a physics outreach event at UC San Diego. As part of a two-week visit to UCSD, San Diego State, and Cal State San Marcos, twenty five middle and high school students traveled to campus on Friday morning to engage in hand-on activities and demonstrations with physics researchers, postdocs, and grad students. They’re part of Intertribal Youth, a fourteen year-old organization directed by Marc Chavez and based in California with the purpose of enriching the lives of young students. The event on Friday was primarily organized by Adam Burgasser, an associate professor of physics, and Dianna Cowern, an outreach coordinator, both at the Center for Astrophysics & Space Sciences. Adam, who has worked extensively on outreach and diversity programs, contacted the ITY group through the UCSD Office of Equity, Diversity and Inclusion, which resulted in this event at Mayer Hall (Revelle College) and other planned outreach events. We planned demonstrations in five physics areas, including electricity and magnetism, vibration and sound, optics and light, solar energy, and momentum. Unfortunately, we had to skip the solar energy one because it was surprisingly cloudy for San Diego—the marine layer persisted all morning. We divided the students into four groups, and they spent about twenty five minutes exploring and learning about each of the other topics. 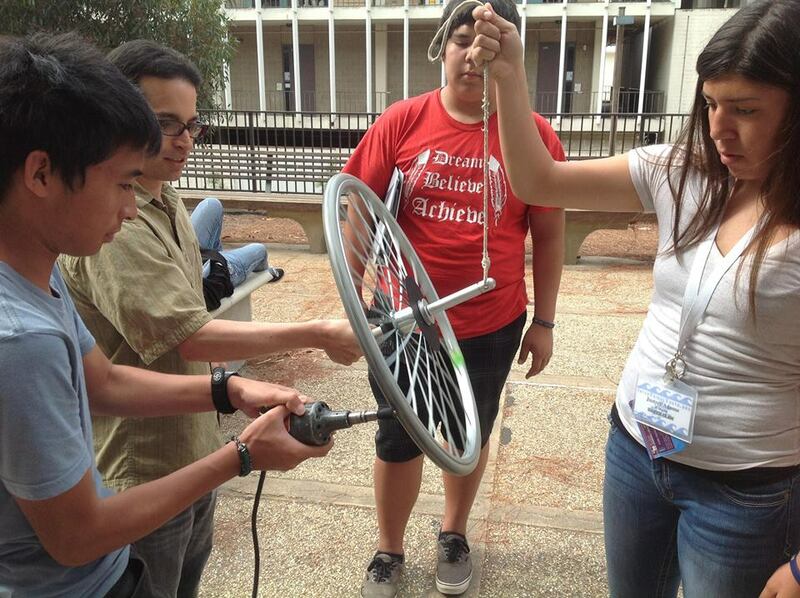 Drew Nguyen and I facilitated demonstrations on Mayer Hall’s balcony on linear and angular momentum, including an air rocket, a rotating chair and hand-crank bicycle wheel, and a basketball and tennis ball. Students discovered that it’s easy to make a simple rocket: we held a 2-liter plastic Coke bottle on a wooden base, poured in a little water and pumped in air with a bike pump, and then let go and watched it take off and fly a couple stories into the air! (I got a bit wet as water spurted out the bottom.) Students experimented with it and some were surprised that without the water to keep the air pressure high, the bottle had no thrust and remained grounded. In another demo, students would spin each other on a rotating stool while keeping their arms extended. Then when the seated person brings in their arms, they rotate faster, just like a rapidly spinning figure skater, which demonstrated the conservation of angular momentum. In a related demo, we hung a bike wheel from a rope attached to its axis, and when it’s spinning rapidly, it could spin vertically or tilted, and the person holding the rope could feel the momentum of the wheel. This demo always impressed students, such as Marla and Dakota. Dakota thought it was “crazy and weird” that the wheel would rotate this way, until he and the other students figured it out. Marla realized that it’s the same principle that keeps a tilted bike from falling over when someone’s riding around a curve in the road. The students enjoyed playing with these and other demos. For example, inside Mayer Hall, they explored a bunch of experiments related to electricity and magnetism. They particularly enjoyed the van de Graaff generator, which is a hollow metal globe on top of a stand and which uses a moving belt to generate static electricity. When you touch it with particular rods, which might be like lightning rods, it generates sparks—and the students sometimes shocked each other too. But touching the globe with your own hand makes your hair stand on end. It was hard to tear the students away from these exciting experiments and continue with them all over the course of the morning. During those couple hours, they actively learned a couple things about physics and engaged with real-life scientists. These outreach events help to spark the students’ interest in science, and particularly in physics and astronomy, and we hope to inspire a few of them will be inspired to pursue science further as they continue their education and become the next generation of scientists. 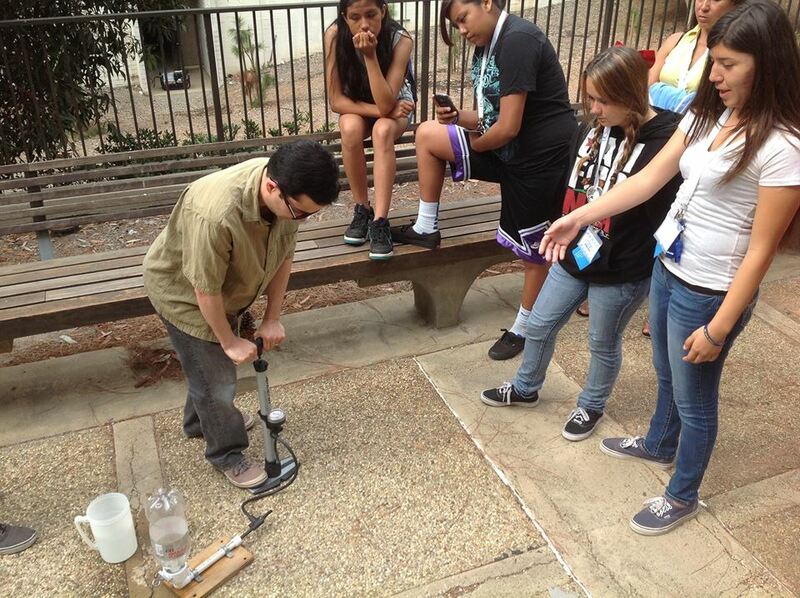 After the demonstrations, everyone loved the liquid nitrogen ice cream, which Adam and the students made on the patio. It tastes a lot like regular ice cream, but it’s much more fun. Over the rest of their visit, the ITY students enjoyed other activities in the San Diego region including a “star party” at the La Jolla Indian Reservation on the following Tuesday night. Thanks, Simon! I was impressed and inspired by these students, most of whom were very engaged in the demonstrations and were figuring things out well.